3D scanned from an actual pike, the Savage Gear Hybrid Pike blurs the lines between hard and soft lures. Two tails included! The Savage Gear Hybrid Pike is a super realistic baby pike imitation loaded with innovative features. 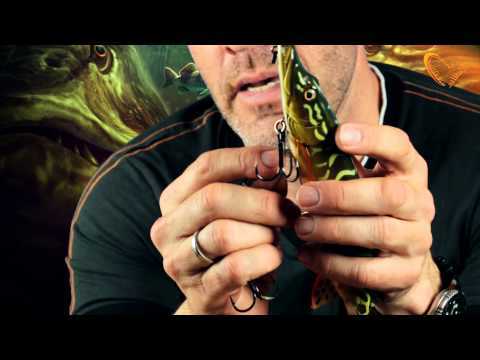 Hybrid Pike includes a deadly combination of two tails: the paddle tail (with a clicking rattle chamber) will give the lure an incredible lively and rocking action. The curl tail can be fished ultra-slow, leaving the front part of the lure very steady and the tail with an enticing and provoking action. When the tail is screwed on tail down – the “up force” on the tail part will push the head of the lure down – so it runs under the surface in more or less the same depth all the way in. Turn the tail up and “down force” on the tail will force the head up – so the eel comes to the surface and runs right under the surface creating a wake effect. The innovative release rig enables the rear hook to detach from the lure body when a fish is hooked. The rig is mounted to a build in swivel – so the fish have a very hard time to roll on the lure and use the force to pull out the hooks. The clever system also protects the soft part of the lure from staying the toothy zone.